Please note: this timeline is under construction, and is therefore incomplete. The data has not yet been reviewed for accuracy. These sermons are numbered according to the system utilized in The Works of John Wesley. In reviewing the timeline, keep in mind that these sermons comprise a structured set of Wesley’s work, in the order which Wesley himself had organized them later in his life (the result, really, of a project started around 1770). They are, then, not necessarily in chronological order; however, they are often helpful in our efforts to trace the development of his thought as he understood it. The first four sermons are what might be called the university sermons; four early sermons which clearly delineate the fundamental Wesleyan doctrine of faith alone (sola fide), while at the same time challenging the academicians of Oxford to live faith from their hearts, not their heads. Here, then, the sermons are numbered in one particular way; there are other numbering systems which are, in their own ways, equally valid (keep your eye on this site as they are added as well, in their own timelines). In many ways, though, this is the “master list” if there is one; it is the order and content determined by Wesley himself for the primary collection of his work. Further, it is difficult to pin down the precise dates that many of these were first preached. In some cases, Wesley himself recorded a specific date. In many other cases, though, his Journal reflects sermons delivered on a particular subject and/or Scriptural text; those sermons were probably early versions of what he would later include in one of the collections. 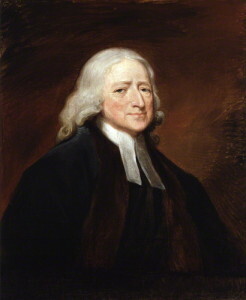 In quite a few instances, the timeline reflects the general dating of the first collection of his sermons, entitled Sermons on Several Occasions (abbreviated SOSO), which was collected and published in 1746. Click here to send me a comment, suggestion, or correction on this timeline. While the above timeline is helpful for understanding the major events in Wesley’s life, as well as the timing and order of his standard sermons, this pales in comparison to the information available in Rex Matthews’ impressive work Timetables of History for Students of Methodism. If you are interested in Methodist history, this is a must-have. Rex has mapped out major events in Methodism, history, science, culture, and more in a side-by-side columnar format. The work starts in 1700 (when Samuel Wesley initially organized what became a prototype society in Epworth), and runs through 2005. This is a rather amazing work, well worth the small investment.